MRI can be a useful problem-solving adjunct in select cases. For example, when an evaluation of the ducts is needed, magnetic resonance cholangiopancreatography (MRCP) can be useful. Findings from plain radiography and upper GI series are nondiagnostic, except the finding of a classic sunburst central calcification, which is suggestive. 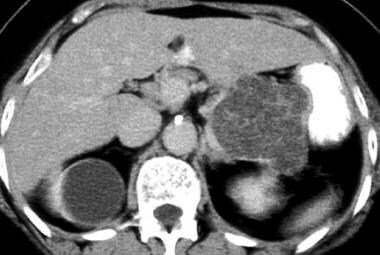 Serous cystadenoma on a contrast-enhanced CT scan. Note the Swiss cheese–like enhancement and gentle external lobulation. MRIs of serous cystadenoma. Top left, T1-weighted image; top right, T2-weighted image; bottom left, T1-weighted gadolinium-enhanced image; bottom right, fat-suppressed T1-weighted gadolinium-enhanced image. The mass is externally lobulated and hypointense on the T1-weighted image and hyperintense on the T2-weighted image, with septal enhancement and, atypically, some larger cysts. Image courtesy of Arnold C. Friedman, MD, FACR. 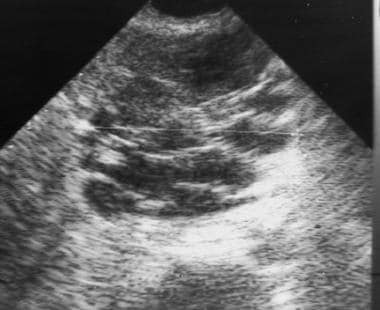 Sonogram of serous cystadenoma. The large mass in the head of the pancreas is externally lobulated, with some cystic-appearing regions, some solid-appearing regions, and increased through transmission. Image courtesy of Arnold C Friedman, MD, FACR. 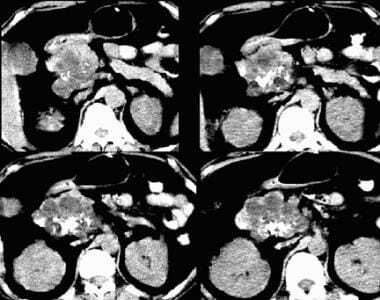 Because of the significant overlap in the imaging findings of mucinous and serous pancreatic tumors, these tumors should be followed up with surveillance computed tomography (CT) scanning to assess interval growth if aspiration is not performed. The main differential diagnoses include mucinous cystic neoplasm, IPMT, pseudocyst, focal pancreatitis, and adenocarcinoma. The diagnosis of pancreatitis and pseudocyst is generally straightforward, especially in a clinical setting of chronic alcoholism with a history of pancreatitis. If the tumor is large enough, symptoms related to mass effects may predominate. Smaller tumors may be discovered incidentally on abdominal ultrasonogram or CT scan. Imaging findings are usually confirmatory in difficult cases. Adenocarcinoma is most commonly solid and, therefore, infrequently confused with cystic neoplasms. The other entities can have imaging features that are highly suggestive of one entity rather than another. Communication with the pancreatic duct strongly suggests mucinous cystic neoplasm or IPMT instead of serous cystadenoma. A central stellate scar with calcification and a grapelike cluster of cysts and external lobulation strongly suggests serous cystadenoma. However, the imaging features of these entities can overlap considerably; therefore, an analysis of the percutaneous cells and cystic fluid is often required for diagnosis. In fact, approximately 10% of all serous cystadenomas have cystic components larger than 2 cm and cannot be distinguished from mucinous cystic neoplasms. When stellate calcification or the classic CT scan features of central sunburst are present in a multilocular cystic mass in an older woman, some institutions accept this as a clearly benign finding. In one series, however, CT scanning was useful in depicting the lesions, but it was not useful in differentiating benign and malignant tumors, serous and mucinous tumors, or pseudocysts and neoplasms. No radiographic abnormalities are associated with serous cystadenoma except those related to a mass that is large enough to displace or obstruct the bowel or those related to a prominent central calcification. The main mimics of this tumor are pseudocysts and mucinous cystic tumors. Serous cystadenoma on a nonenhanced CT scan. Note the central calcification, attenuation similar to that of water, and external lobulation. The tumor generally has attenuation similar to that of water on nonenhanced scans, and it typically enhances with contrast in a Swiss cheese–like pattern. Some tumors have a few cysts larger than 2 cm. The use of a gradient-echo pulse sequence with a long echo time (TE) may bring out the susceptibility effects from the calcified scar. MRCP is helpful in demonstrating the relationship of the mass to the main pancreatic duct. The main duct is almost never obstructed, but the duct and its branches may be gently splayed and draped. Gadolinium-based contrast agents (gadopentetate dimeglumine [Magnevist], gadobenate dimeglumine [MultiHance], gadodiamide [Omniscan], gadoversetamide [OptiMARK], gadoteridol [ProHance]) have been linked to the development of nephrogenic systemic fibrosis (NSF) or nephrogenic fibrosing dermopathy (NFD). For more information, see the eMedicine topic Nephrogenic Systemic Fibrosis. The disease has occurred in patients with moderate to end-stage renal disease after being given a gadolinium-based contrast agent to enhance MRI or MRA scans. Rarely, a fluid-filled diverticulum of the transverse duodenum may mimic a cystic pancreatic mass. Octreotide (OctreaScan) can be used to detect pancreatic tumors that express somatostatin receptors (eg, neuroendocrine tumors), because the agent is avid for these receptors. However, serous cystadenoma does not typically express these receptors. Serous cystadenomas typically demonstrate intense peripheral hypervascularity at angiography, although this finding is nonspecific. Colonna J, Plaza JA, Frankel WL, Yearsley M, Bloomston M, Marsh WL. Serous cystadenoma of the pancreas: clinical and pathological features in 33 patients. Pancreatology. 2008. 8(2):135-41. [Medline]. Garcea G, Ong SL, Rajesh A, Neal CP, Pollard CA, Berry DP, et al. Cystic lesions of the pancreas. A diagnostic and management dilemma. Pancreatology. 2008. 8(3):236-51. [Medline]. Lévy P, Rebours V. Differential Diagnosis of Cystic Pancreatic Lesions Including the Usefulness of Biomarkers. Viszeralmedizin. 2015 Feb. 31 (1):7-13. [Medline]. Hol L, Signoretti M, Poley JW. Management of pancreatic cysts: a review of the current guidelines. Minerva Gastroenterol Dietol. 2015 Jun. 61 (2):87-99. [Medline]. Chu LC, Singhi AD, Haroun RR, Hruban RH, Fishman EK. The many faces of pancreatic serous cystadenoma: Radiologic and pathologic correlation. Diagn Interv Imaging. 2017 Mar. 98 (3):191-202. [Medline]. Wen Z, Yao F, Wang Y. 64-Slice spiral computed tomography and three-dimensional reconstruction in the diagnosis of cystic pancreatic tumors. Exp Ther Med. 2016 Apr. 11 (4):1506-1512. [Medline]. Jais B, Rebours V, Malleo G, et al. Serous cystic neoplasm of the pancreas: a multinational study of 2622 patients under the auspices of the International Association of Pancreatology and European Pancreatic Club (European Study Group on Cystic Tumors of the Pancreas). Gut. 2016 Feb. 65 (2):305-12. [Medline]. Liu QY, Zhou J, Zeng YR, Lin XF, Min J. Giant Serous Cystadenoma of the Pancreas (⩾10 cm): The Clinical Features and CT Findings. Gastroenterol Res Pract. 2016. 2016:8454823. [Medline]. Lewin M, Hoeffel C, Azizi L, Lacombe C, Monnier-Cholley L, Raynal M, et al. [Imaging of incidental cystic lesions of the pancreas]. J Radiol. 2008 Feb. 89(2):197-207. [Medline]. Sahara S, Kawai N, Sato M, Ikoma A, Minamiguchi H, Nakai M, et al. Differentiation of pancreatic serous cystadenoma from endocrine tumor and intraductal papillary mucinous neoplasm based on washout pattern on multiphase CT. J Comput Assist Tomogr. 2012 Mar-Apr. 36(2):231-6. [Medline]. Kadiyala V, Lee LS. Endosonography in the diagnosis and management of pancreatic cysts. World J Gastrointest Endosc. 2015 Mar 16. 7 (3):213-23. [Medline]. Del Chiaro M, Verbeke C, Salvia R, Klöppel G, Werner J, McKay C, et al. European experts consensus statement on cystic tumours of the pancreas. Dig Liver Dis. 2013 Sep. 45 (9):703-11. [Medline]. Dewhurst CE, Mortele KJ. 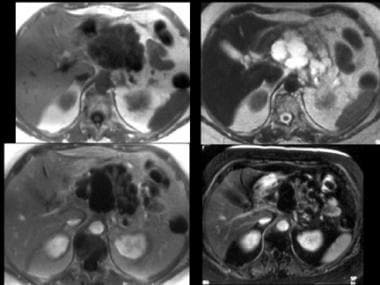 Cystic tumors of the pancreas: imaging and management. Radiol Clin North Am. 2012 May. 50(3):467-86. [Medline]. Warshaw AL, Compton CC, Lewandrowski K. Cystic tumors of the pancreas. New clinical, radiologic, and pathologic observations in 67 patients. Ann Surg. 1990 Oct. 212(4):432-43; discussion 444-5. [Medline]. Megibow AJ, Lavelle MT, Rofsky NM. MR imaging of the pancreas. Surg Clin North Am. 2001 Apr. 81(2):307-20, ix-x. [Medline]. Starkov IuG, Solodinina EN, Shishin KV, Plotnikova LS. [Endoscopic ultrasonography in diagnosis of surgical treatment of pancreas]. Khirurgiia (Mosk). 2008. 47-52. [Medline]. Sun Y, Zhou F, Liu F, Hu Y, Tan S, Liang P, et al. Discrimination of serous cystadenoma from mucinous cystadenoma in the pancreas with contrast-enhanced ultrasonography: a prospective study in 61 patients. Onco Targets Ther. 2017. 10:1285-1294. [Medline]. Kume N, Suga K, Nishigauchi K. [Evaluation of pancreatic cancers using thallium-201 single photon emission computed tomography]. Nippon Igaku Hoshasen Gakkai Zasshi. 1995 Aug. 55(9):682-9. [Medline]. 'Transformative' Tool for Pancreatic Cysts, Cancer?